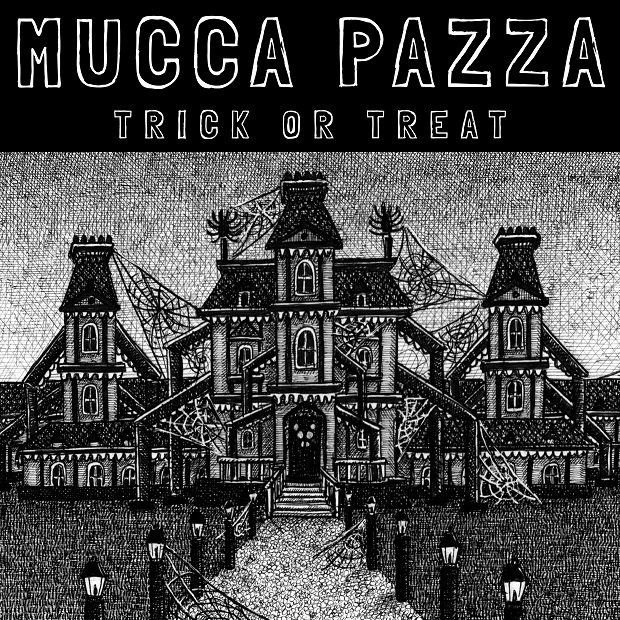 Our new release, Trick or Treat, is a short and sweet short-term time capsule - the result of Mucca Pazza spending a weekend in late September 2016 in Electrical Audio's Studio A with engineer and former Mucca Pazza trombonist Nick Broste. You can hear the shape of that gorgeously idiosyncratic live room in the full and luscious resonance of the horns, in the clarity and focus of the drumline, the asymmetrical ceiling perfectly encapsulating the unity and individuality of the miscellaneous 26-piece ensemble. But in a departure for Mucca Pazza, Trick or Treat starts out surprisingly spare. Not a single horn is heard for the first two and a half minutes of “The Orange Show,” a sanguine love-letter to American soul music that adventures through a spare sonic landscape to unexpected modalities, but ends with a full complement of epic brass (composed by electric mandolinist emeritus Gary Kalar). In the lush, inviting, and wistful “Rest on Muffin Street,” by saxophonist David E. Smith, the winds and brass are front and center from the start, overlapping each other with Escher-like intricacy. Smith’s signature interlocking countermelodies take a darker turn in “Mr. Spider Goes Home to Spiderland,” an anthem for anyone who can’t go on, but goes on anyway. Trick or Treat ends in “Snare Bath,” a metaphysical spell cast by the drummers meant to guide the listener back into the real world safe and only slightly changed - let the soothing sound of multiple snare drums wash over you as you enter a dreamlike, meditative state. Remember: if you don’t like the licorice the neighbors gave you, you can always trade it with your brother. Like a heavy pillowcase of hard-earned Halloween candy, Trick or Treat holds something for everyone. 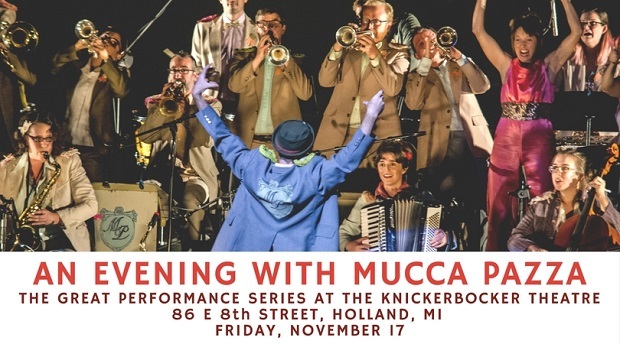 Our two-act theater show, An Evening With Mucca Pazza, is coming to The Knickerbocker Theatre in Holland, MI on 11/17/17! We’ll don our fancy pastels and sit down for the first half of this elegant evening, but after a brief intermission, we're back to being a little marching band! Mucca Pazza is socially aware enough to recognize that it’s been invited to a formal event, and rises to the occasion by sitting down and behaving itself. Dressed to impress in their best pastels, the musicians contain their usually-frenetic energetic selves and concentrate on the task at hand: passing themselves off classic classy class act, a traditional big band. Cheerleaders, now Masters of Ceremony, graciously offer moments of poetry both sublime and absurd. With heartfelt musicianship and more dynamics than ever before, Mucca Pazza invites you to have a seat, tuck in, and pass the time. 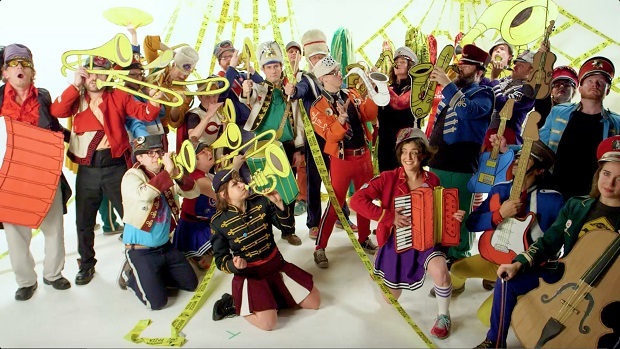 Whereas a traditional marching band functions as a single entity, moving through carefully planned formations and creating discernible images and shapes, Mucca Pazza... doesn’t. A dazzlingly constant succession of individual (and inadvisable) choices by band members bring into sharp relief the occasional moments of unanimity. The relentless fun and visual cacophony of two-dozen-plus people dancing like no-one’s watching forms a mind-boggling and delightful contrast with the band’s musical dexterity, and the density and complexity of the arrangements never get in the way of the catchiness of the tunes, or the fun of watching those tunes come to life.